We all love Curious George, right? 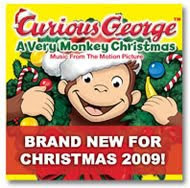 Well, did you know that there's a movie called Curious George: A Very Monkey Christmas? Me either, until I signed up to review this soundtrack! "A Very Monkey Christmas" is the first ever holiday-themed movie to feature the beloved children’s character Curious George and will air during PBS pledge drive programming beginning November 25th and continuing throughout December. The soundtrack to “A Very Monkey Christmas” will feature the television show’s theme performed by SLG/429 Records’ Grammy winning recording artist Dr. John with songs and score composed by Nick Nolan. The soundtrack follows the story line of the movie through song and music: George and The Man with The Yellow Hat are having a very merry time counting down the days until Christmas. There’s only one puzzle: neither of them can figure out what to give the other for a present. The Man is having trouble reading George’s wish list and George doesn’t have a clue about what to get for The Man who has everything. Will they be able to find the answers before Christmas morning? December 18, 19, 20 and Christmas Day, December 25 (check local listings for exact air dates and times). You can also catch Curious George Monday through Friday on PBS Kids (check local listings). My children and I received a copy of the Soundtrack to this movie and we all enjoyed it and had a great time listening to this CD. My favorite is the Curious George Christmas Medley! My daughter said she loved Jingle Bells and my son loved the Twelve Days of Christmas. What a fun CD, for anyone of any age! My kids are 10 and 13 and they still enjoyed this CD! Now we just can't wait to see the movie! One of my readers will win a copy of this soundtrack! This giveaway will end on 12/16/09 at noon EST. I will announce the winner here at A Simple Kinda Life and they will be emailed. Winner will have 48 hours to respond to my email or they will forfeit their prize. Disclaimer: This post was written for Family Review Network as part of a program for Denon Records, who supplied the CD for review. My kiddos we giggling and trying to learn the words to Christmas with a Monkey!! My fav song would be the 12 Days of Christmas! Christmas With a Monkey (Betsy's song) Very nice tunes! My favorite would be "Christmas With A Monkey". Thanks! I entered the giveaway for "The Snowman's Song" storybook.